The guide books say that Kumbakonam is home to more than 100 temples. I did not count but almost every street corner has an ancient temple. Steeped in antiquity, Kumbakonam dates back to the Sangam era and has been ruled by every dynasty from the Early Cholas to the later Cholas, the Vijaynagar kings, the Nayaks and the Marathas . A capital town of the Medieval Cholas around the 7th-9th centuries, even the British had an inclination to the town, dubbing it as Coombaconam. However legends relating to the origin of the town took me to a massive water tank brimming with water and glittering in the morning heat. It is pin drop silence as I enter one of the largest and oldest temples that gave its name to the town. Craning my neck to see the nine tiered 127 feet tall Gopura, I see a pantheon of deities looking down at me. Dedicated to Shiva, Adi Kumbeshwar temple spread over four acres and built almost 1300 years ago is one of the grandest shrines built by the Cholas. Walking past the colourful corridors and the silver chariots, I enter the shrine where I hear a much more detailed version of the legend that tells the story of the town. As an epoch ended, Shiva advised Brahma to carry his mythical pot containing the elixir of life and the seeds of creation to the Himalayas and place it atop the peak. But as the pot was carried away by the deluge, Shiva in the guise of a hunter or kirata aimed at it with his bow and arrow and the nectar flowed out, releasing into the Mahamaham tank. 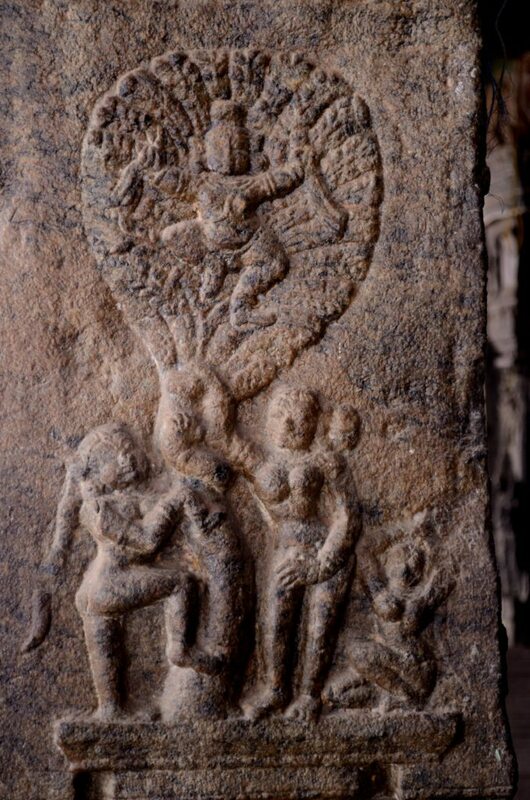 Shiva used the clay of the pot and with the nectar carved a linga here and hence he is believed to be worshipped as Kiratamurti or Adi kumbeshwara or Kumbeshwara. Another famous Shiva temple in the town is the Nageshwaran shrine where the deity is worshipped as the king of serpents. Built in the 9th century by the king Aditya Chola, the temple is in the form of a chariot and the sunlight streams in and falls on the deity during the Tamil month of Chitrai, which is around April/May. I head to another shrine with another towering gopuram. 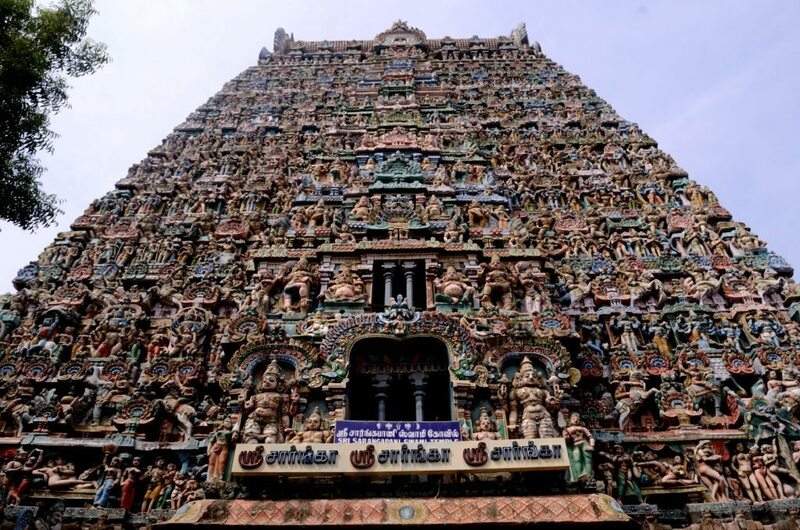 Dedicated to Vishnu, the Sarangapani temple has the largest gopuram in town with 12 tiers rising up to 175 feet built by the Vijayanagar kings in the 15th century. I often wonder how the kings of ancient times would have built such towering marvels. The temple is however much older with the Medieval Chola kings adding their architectural touch to the shrines. But the more curious story is about a devotee of the temple who died heirless on the day of Deepavali several years ago. It is believed that the lord himself completed his last rites and even today the ritual continues with the priests doing it every year. My next halt is the much older, quieter shrine where Vishnu is worshipped in the form of his chakra or disc with eight arms. There is a certain peace, a bliss and a moment with the divine which can be experienced only in solitude. I find that here in Chakrapani temple. Elegant pillars give an aesthetic touch here as I spend some time sitting here and losing myself in the silence. 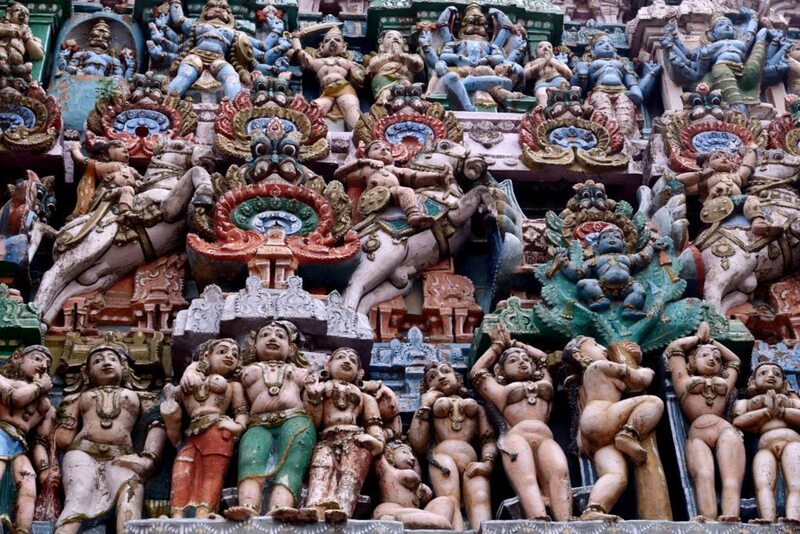 If you have the time, I recommend a quick visit to the ancient Ramaswamy temple, where besides the larger than life size of the deities, one can see the story of Ramayana illustrated on the walls. Driving in the radius of 5-15 kms in and around Kumbakonam, I am on a temple trail visiting quiet and humble villages that were once the abodes of gods, saints and kings. Each village has an ancient temple with towering gopuras, artistically carved pillars, massive mandapas. Whether you are a pilgrim or a heritage enthusiast, a mélange of art, architecture, local culture, myths and legends take you on a spiritual high here. 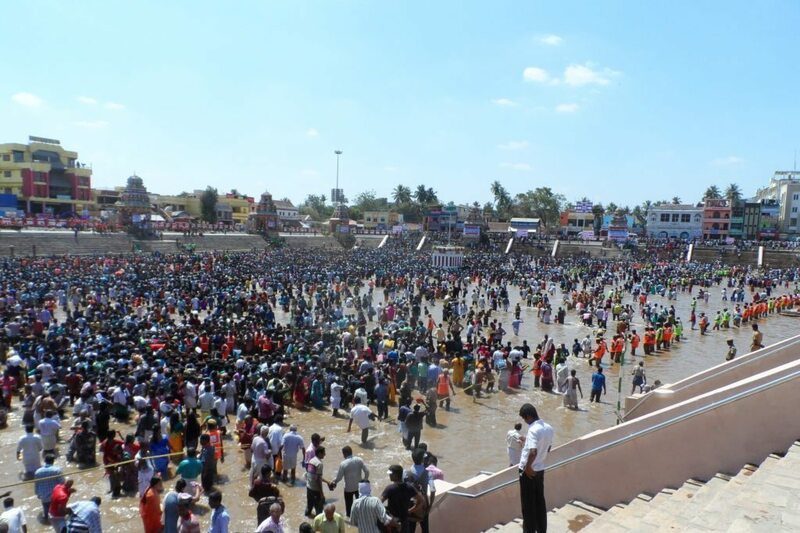 8 kms from the town is Thirunageshwar, a small village known for the Oppiliappan and Naganathar temples. 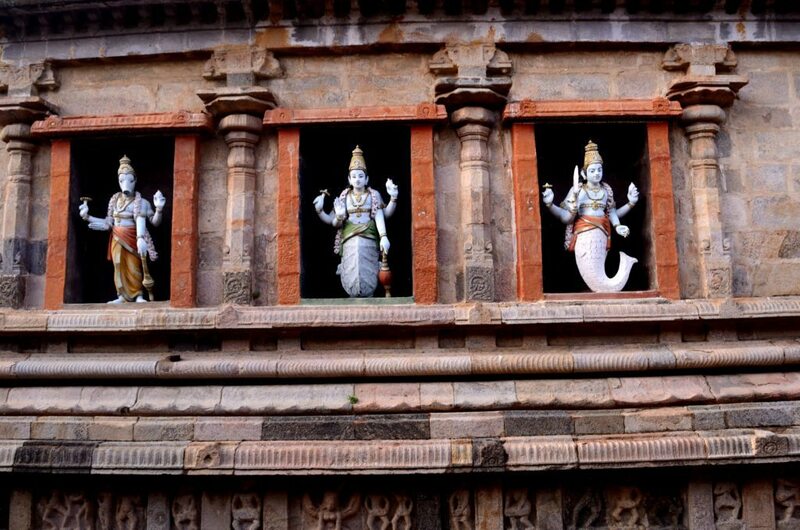 Another temple is the Nachiar temple in Thirunarayur built by the Cholas dedicated to Vishnu and Lakshmi . Devotees also queue up to see the Murugan temple atop a small hillock at Swamimalai very close to the town. At Thirubhuvanam is another Shiva temple, Kampaheshwarar built by the Cholas and devotees also pay respects to Shiva and Durga at the Thenupureeshwarar temple in Patteeshwaran. 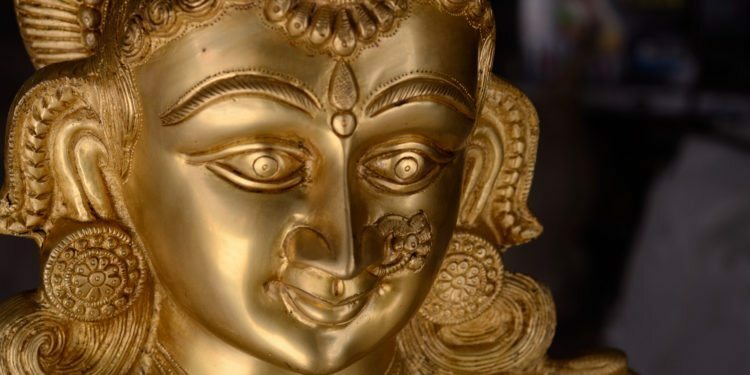 Another trail that is rather popular is the Navagraha group of temples, where shrines are dedicated to the nine planets. Lose yourself in awe by marveling at some of the most spectacular monuments that date between the 10th-12th centuries built by the Chola kings. I am speechless and humbled as I stand in front of these temples. A part of the World UNESCO sites, one can revisit history here by heading to the Big Brihadeshwara temple at Thanjavur built by Raja Raja Chola, the incomplete replica of the Brihadeshwar temple at Gangaikondacholapuram and the Airavateshwara temple built by Raja Raja 11 at Darasuram. The Big temple is Raja Raja Chola’s masterpiece with its 216 feet tall tower and ancient frescos painted on the walls inside it. His son aimed to better it at his new capital Gangaikondacholapuram but he seemed to have had a sudden change of mind as he left it incomplete. But it is the third at Darasuram that captures my attention . If the first two temples make you go speechless with the grandeur and larger than life deities carved on the walls, the chariot shaped temple at Darasuram is nothing but poetry on stone. 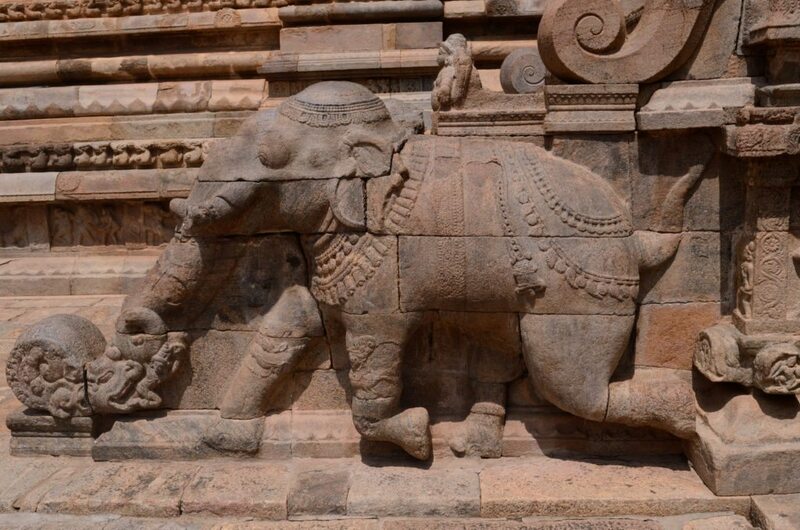 Miniature carvings fill the walls and pillars of this temple narrating stories from epics. Even a day is not enough to marvel at these sculptures. There are more than just shrines but are living testimony to the greatness of the art and architectural skills of the Chola kings who built them and hence are aptly titled Great Living Chola temples. At 10 kms from Kumbakonam is the temple town of Swamimalai, where Murugan sits atop a hill and blesses the people who live around the town. I reach the temple early in the morning when there is hardly any soul and pay my respects to the deity. And then, I am on a quest . 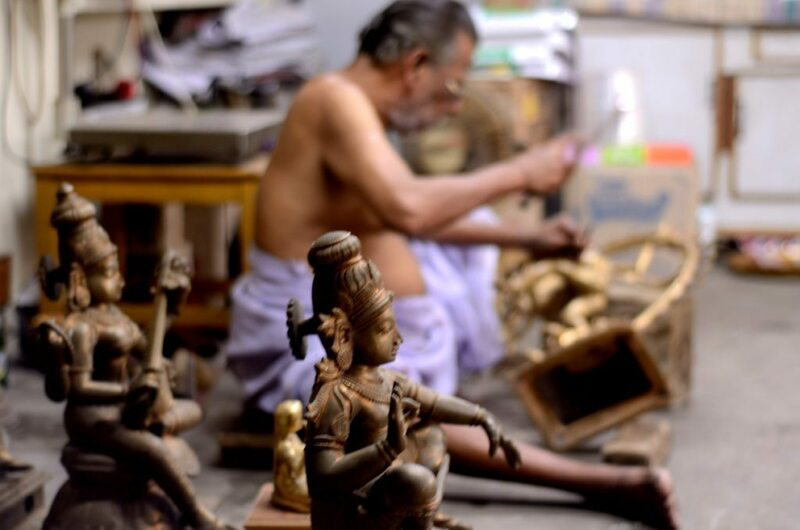 I am not looking for Gods or men or Godmen but men who create Gods – the idol makers or Stapathis. I am particularly looking for Srikanda Stapathi who was featured by William Darlymple in Nine Lives. 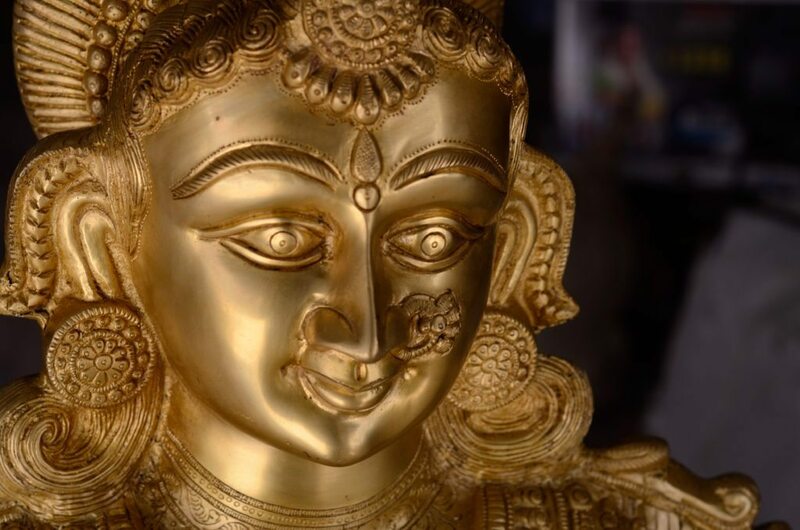 I however met his brother Swaminathan who takes me around the workshop to show me how the idols were carved and the bronzes were cast . 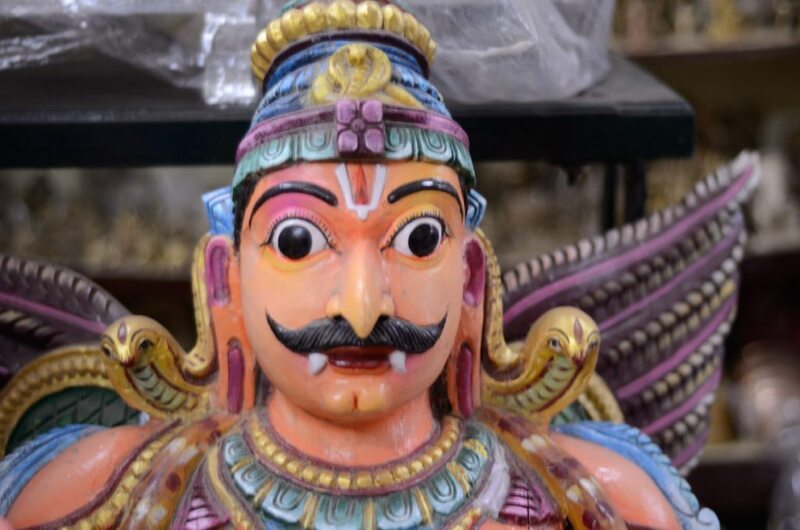 Stapathis am told are sculptors who have been trained in bronze casting of idols since the era of Raja Raja Chola1 and for 1000 years the craft has been handed down from generation to generation. As I walk around the workshop, I learn that the deities are carved according to the rules laid down in the ancient texts of Shilpa Sastras. 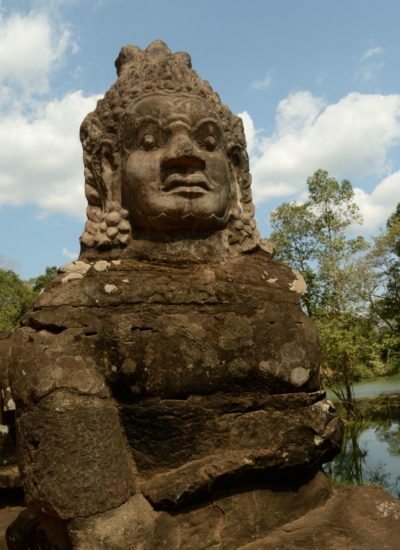 Scattered around me were several stapathis carving idols of gods and goddesses, some for temples, others for collectors. But the men believe that they are creating Gods, not just sculptures .” Until the eyes are opened, they are just pieces of art. 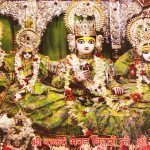 And then they are Gods to us, “ explains Swaminathan. A walk through the lanes of the town is an assault on the senses. At every corner is an explosion of colour and noise. Autos and mopeds are at logger heads as they vie past each other. A cart filled with pearly white jasmines is thrust in front of me . I turn into another street to find the streets filled with bronze lamps and vessels. Here everything that glitters is not gold but bronze. The strong aroma of filter coffee stirs my nostrils as I turn around to find a tiny coffee shop. The dusty walls are filled with portraits of Gods and Goddesses while sacks bursting with raw coffee seeds are stacked against them. A whiff of freshly ground powder from the roasted seeds floats in the humid air. The table is filled with an array of filters and dabaras and tumblers, the traditional way of making and serving filter coffee. 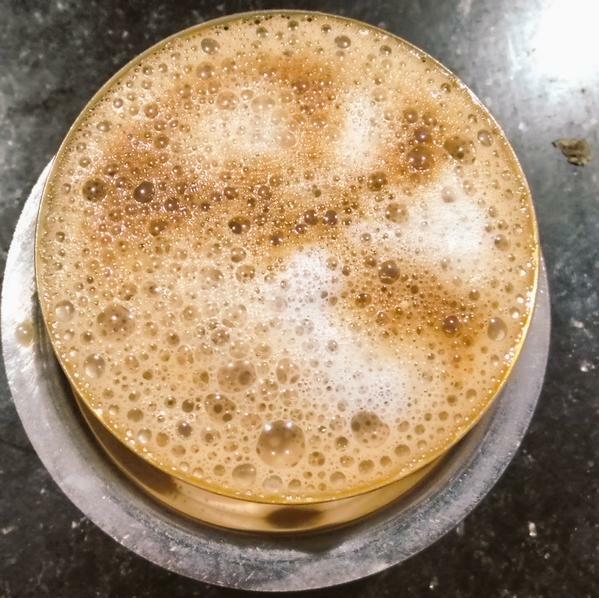 “Not any ordinary filter coffee, this is the famous Kumbakonam degree kaapi, “ says the vendor as he pours into a tumbler the dark brown beverage, the decoction and mixes it with boiling milk. This is the signature brew of Kumbakonam and almost every coffee shop here announces that it serves the original degree kaapi. Coffee connoisseurs may look down on the chicory that has been blended but it is the bitter sweet flavour that is the speciality of this brew. I hear various explanations to the word “degree”. Some say it’s the “degree” of purity of fresh cow’s milk, which is proved by a lactometer others say it’s the perfect “degree” at which the milk has been boiled. I really do not care. To me it is the perfect cup on a warm morning in Kumbakonam as I take in the vibrant atmosphere of the town. In Kumbakonam and in the neighbouring Darasuram or in Tirubhuvanam, I meet with local weavers who have been in the family tradition for years. 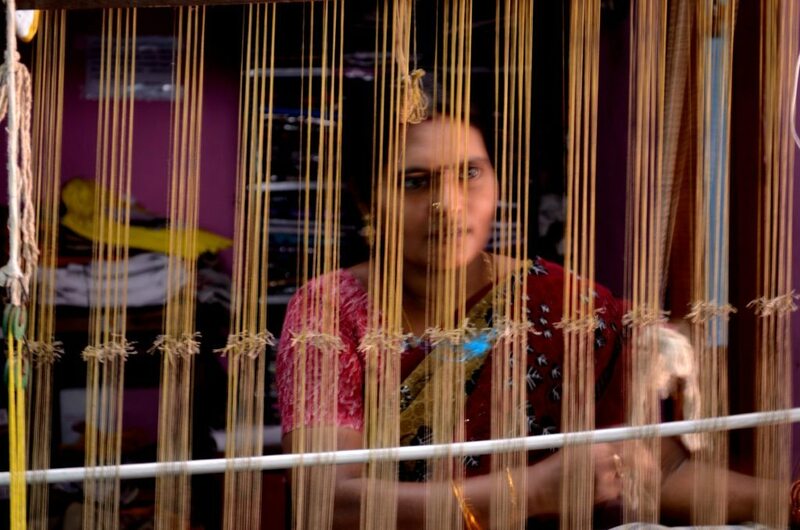 Weaving both silk and cotton and creating their own designs, the speciality here is a Tirubhuvanam silk saree which may seem pale in comparison to the grandeur of the Kanchipuram silk saree but it is the lifeline of the weavers living in the Cauvery delta region. Kumbakonam is Getting therea very historic and ancient town located along the banks of the rivers Cauvery and Arasalar in Tamil Nadu . 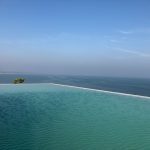 It is about 40 kms from Thanjavur and 90 kms from Tiruchirapally and 280 kms from Chennai. The closest airport is at Tiruchirapally besides Chennai. Trains connect Kumbakonam from key cities like Chennai and Bangalore as well. 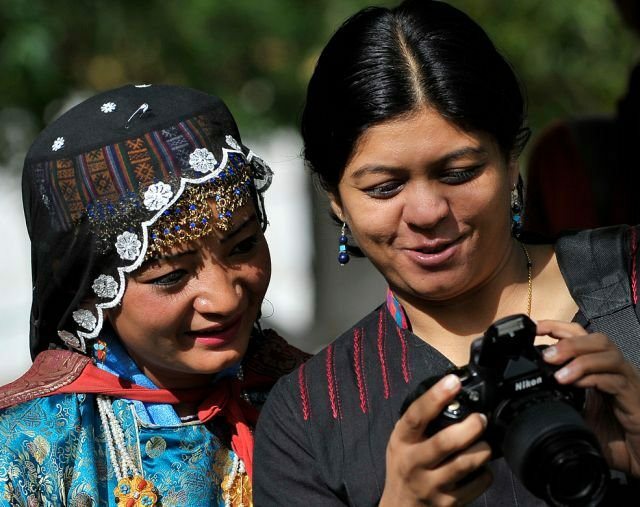 This story was published in National Geographic Traveller. For a couple of times, I by-passed my curiosity to open the article from the CBC FB page. But the third time I couldn’t resist the beauty of this bronze lady. 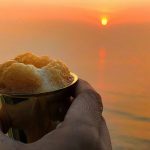 Being our family native, I’ve cherished all of that you’ve mentioned here about Kumbakonam, from the temples to degree kaapi. And I every time I visit, I return back feeling that there’s so much more to explore in this place. 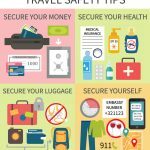 Captivating travel account, Lakshmi! Congratulations! Your blog post was selected for Tangy Tuesday Picks edition on Feb 23, 2016 at BlogAdda.